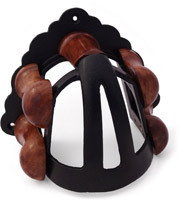 Store your tack with style! 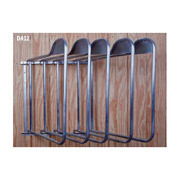 - This classic tack room fixture is improved with heavier duty construction, a solid wood base, and rust-proof powder-coated black metal sections. 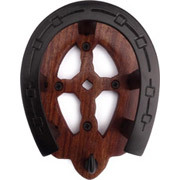 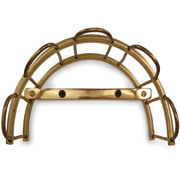 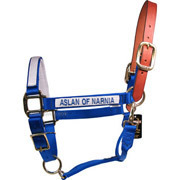 This bridle bracket's arched design supports leather crowns and prevents unnecessary wear by spreading the weight of the halter, bridle, or headstall over a larger section than a plain hook does. 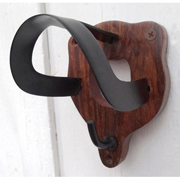 This elegant, classic style tack room bracket includes a plain hook at the bottom so additional items may be stored. Solid Black hooks and racks have an cast iron appearance that brings a vintage charm to any storage area. 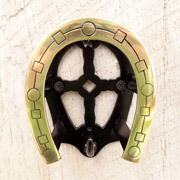 Also available in brass finish.